Researchers of the Department of Anthropology of the Americas at the University of Bonn have discovered a mass grave in an artificial cave in the historical Maya city of Uxul (Mexico). Marks on the bones indicate that the individuals buried in the cave were decapitated and dismembered around 1,400 years ago. The scientists assume that the victims were either prisoners of war or nobles from Uxul itself. For the last five years, archaeologists of the department of Anthropology of the Americas of the University of Bonn have been excavating in the historical Maya city of Uxul in Campeche (Mexico) with the aim of researching the origins and the collapse of regional states in the Maya lowlands. The project headed by Prof. Dr. Nikolai Grube and Dr. Kai Delvendahl from the University of Bonn, as well as Dr. Antonio Benavides from the Mexican National Institute of Anthropology and History, which is funded by the Deutsche Forschungsgemeinschaft (DFG) has now made a sensational find: they have uncovered the skeletons of 24 people in an approximately 32 square meter artificial cave that had formerly been used as a water reservoir. "Aside from the large number of interred individuals, it already became apparent during the excavation that the skeletons were no longer in their original anatomical articulation", says the archaeologist Nicolaus Seefeld, who studied the sophisticated water supply system of Uxul for his doctoral thesis and discovered the mass grave. All of the skulls were lying scattered around the interior of the cave, in no relation to the rest of the bodies. Even the majority of the lower jaws were separated from the heads. In contrast, detailed examination determined that the limbs of the legs and hands were in some cases completely preserved. "This observation excluded the possibility that this mass grave was a so-called secondary burial, in which the bones of the deceased are placed at a new location", says Nicolaus Seefeld. According to the conclusions reached by the scientists, the spatial pattern of the bones indicates that the corpses of the 24 people had been decapitated and dismembered. Signs of violent death could be proven for the majority. "The observed hatchet marks on the cervical vertebra are a clear indication of decapitation", Seefeld reports. The forehead of another skull shows an unhealed skull fracture, probably caused by a blow from a cudgel. In addition, numerous skulls show signs of cutting with sharp objects, which might originate from stone hatchets. Some of the dead had tooth inserts of jade. The scientists interpret this as a sign of high social status. However, the archaeologists of the University of Bonn don't yet know whether they are prisoners of war from another Maya city that were sacrificed in Uxul or nobles from Uxul itself. 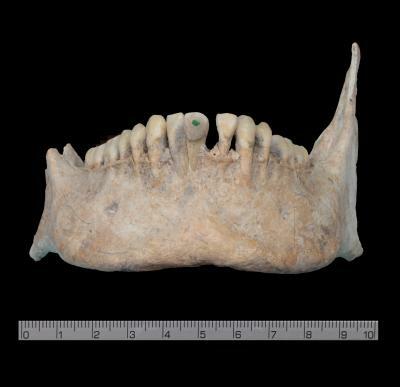 Only with the help of isotope analysis will it be possible to clarify whether the dead were members of the local population or originate from another region of the lowlands. "However, the discovery of the mass grave proves that the dismemberment of prisoners of war and opponents often represented in Maya art was in fact practiced", says Prof. Dr. Nikolai Grube.